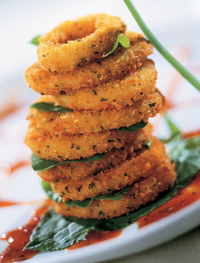 Great taste and from-scratch look brings operators a rare, stand-out opportunity to entice passionate calamari lovers. Mrs. Friday's Lightly Breaded Ring and Tentacle Calamari is hand-breaded in a crispy flour coating with a 70/30 ratio of tender calamari rings and tentacles. It's an unbeatable combination of popularity, convenience, and consistency. In deep fryer, heat oil to 350°F. Add calamari, shaking basket to separate pieces during cooking. Cook for 1 minutes and 30 seconds or until golden brown. Do not over cook. NOTE: Oil temperature is critical to proper browning. Test temperature with a cooking thermometer or drop a few pieces of breading into the oil. Oil is ready if crumbs sizzle immediately and float. Always allow oil to reheat before cooking more pieces.